In South Korea mobile television made enormous headway driven by advances in the quality of screens. That extra detail made the pictures watchable on small screens. Both public terrestrial and satellite mobile TV services were launched. This is where to look for the pioneering mobiles designed for mobile TV. It is an important gap that still needs to be filled in this account of the evolution of mobiles. Nokia went to enormous efforts to get mobile television off the ground in Europe based upon the DVB-H mobile television standard. Alcatel even had visions of mobile satellite television. 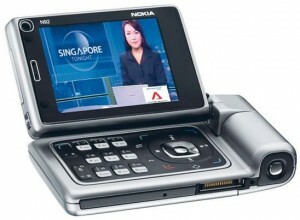 Nokia brought out the N92 as a flag ship mobile to stimulate consumer take-up of mobile TV. It incorporated a DVB-H chip. The n92 had a rolling 30 second capture of the video that allowed instant replays and a VCR function although this needed a plug in memory card since the mobile itself only had 40MB of integrated storage. DVB-H networks were launched in Italy, Germany and Finland but lack of radio spectrum blocked DVB-H networks emerging in the UK, France and elsewhere. This in turn depressed the scale economies and mobile TV never really took off in Europe. The space was left for watching TV on a new generation of smartphones via the broadband mobile Internet.